This entry was posted on Thursday, April 17th, 2014 by Frances Ryan. For the last few weeks, I have been struggling to overcome my desire to eat loads of candy and sweets as part of my Lenten sacrifice. If you’re a regular Just Frances reader—or if you know me at all—you will know that giving up sweeties is a fairly major undertaking. Still, my heart and soul have been committed to the sacrifice and I have been (mostly) happy that I made the decision to alter my eating habits in an effort to strengthen my relationship with my Saviour. Of course, now that Easter (and the end of Lent) is just a couple of days away, I have started to allow myself to begin stockpiling goodies for a massive binge session after Easter Mass. And it would seem that others are getting involved in the act of preparing me, too! Something I wasn’t expecting but that has warmed my soul greatly! Today, I was blessed to have received two parcels. One this morning from friends in the Highlands and another this afternoon from my folks back home. The first was a wee box of “old fashioned” sweets with a note explaining that they were meant to help me break my Lenten fast. 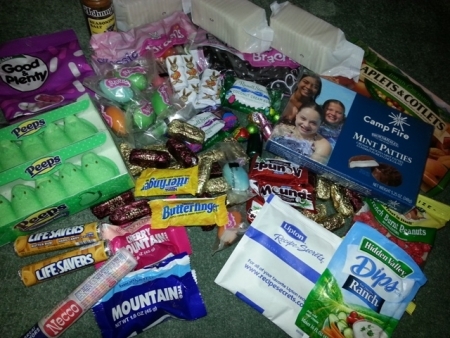 The second was a large box filled with loads of different Easter candies, some Camp Fire mints, saltines, and loads of other goodies from the Homeland. I am so excited about all of these lovely goodies and I can’t wait to tuck into them come Easter Sunday. Now the hard part is going to be making it through the next couple of days without cheating. Must. Stay. Strong. Wow! That box didn’t take long to make it across the pond! I hope you enjoy it. Did you like the way I “protected” those tiny sleeves of saltines?! If there is anything that you will be needing/wanting in the next couple of months, let us know. I’ll be starting to set stuff aside in perhaps a smaller box for later in the year.